When the average temperature was colder than minus 20 degrees Fahrenheit for a recent January, appreciation for heated buildings among the 100,000 tropical animals living in Interior, Alaska, known as humans, was boosted. "That cold spell put shelter in perspective," said Jack Hébert, a homebuilder in Fairbanks who has seen the best and worst of Alaska construction during 30 years of work. He's now using that experience as president of the new Cold Climate Housing Research Center, an organization dedicated to finding products and building methods that work best in the cold. 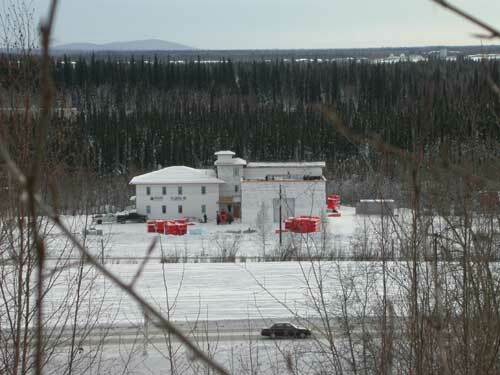 The research test facility of the Cold Climate Housing Research Center is under construction in a low spot south of the main University of Alaska Fairbanks campus. Hébert recently gave a tour of the research center's test facility, a building workers are now putting together using some of the best cold-weather materials and building techniques known. The biggest names in the business have donated triple-pane windows, wall and roof insulation, vapor-barrier sheeting and other materials for the building. Besides being a place where manufacturers can test their products in Alaska, the building is itself an experiment. There are tiny thermometers known as thermisters running through the walls and foundation, and deep into the soil, to show how materials perform. "We have 300 probes through the foundation alone," Hébert said. The new lab is built on an old agricultural field south of the University of Alaska Fairbanks, and permafrost-soil frozen for more than two years-is present about 20 feet below the ground surface. The foundation has jacks and other devices built in to compensate for building movement, if surrounding permafrost should melt. When finished, the building will recycle most of its water, treating sewage and graywater on site with the help of microbes that break down organic matter. A primary heat source will be a 12,000-pound masonry heater that will burn wood in one clean, quick blast every day, releasing the heat slowly. Part of the roof will be alive with native plants and there will be an area for outdoor seminars when the weather is nice. Under the living roof will be a materials testing lab, where companies may see if their products can earn an "Alaska Tested Tough" label. "We want to change the way shelter is approached in the North," Hébert said. "If something works here, imagine how well it will work in Minnesota." With its wide temperature swings (the state high temperature of 100 degrees Fahrenheit at Fort Yukon and the low of 80 below zero at Prospect Creek occurred about 150 miles apart; during the past two weeks, Fairbanks temperatures have varied from 40 below zero to 40 above), Alaska's Interior is a good place for perfecting building materials, said Rich Seifert, the energy and housing specialist at the Cooperative Extension Service of the University of Alaska Fairbanks. "We have almost every northern building problem up here besides high winds-permafrost, high temperature differential, seismic danger, radon, the need for reliable heating and energy efficiency, and 45 days on either side of the winter solstice when you can't use solar power" Seifert said. "Interior Alaska is a huge natural lab." Now supervising the construction of the research test facility, Hébert was also the person who persuaded building-material companies to test their windows, insulation, and other products on the building. He is a man living out a dream that came to him during the last three decades as he designed homes and pounded thousands of nails. "I'm a builder; I'm not sure how long I'll last in that office," Hébert said, pointing to a second-story corner where he'll have a desk sometime soon. "But there's a generation of work to do here. This is just the start." Ned Rozell [nrozell@gi.alaska.edu]is a science writer at the institute.